Marriage experts Peter and Heather Larson and David and Claudia Arp propose 52 fun, creative ideas for meaningful yet inexpensive dates that will help energize relationships. 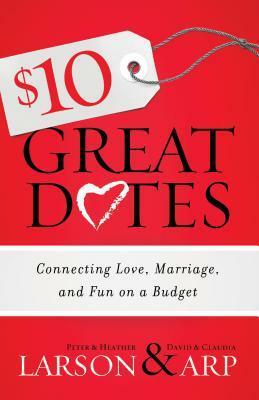 It's tough to review a book about great dates, when you're not currently dating. However, I do have faith that somewhere down the road, some guy and I are going to start dating and this book will come in handy! It's broken down into categories of dates, such as At-Home, Outdoor, etc. I'm not sure that all of them really fall into the $10 category, but I bet that you guys can get creative within the ideas. After all, every date should include a little bit of the people involved, don't you think? I love how this book is organized, the fun ideas that it includes, and honestly, I'm just missing the guy! If you're interested in checking out this book, head on over to Amazon, pick it up and start planning for some fun dates ahead! Book Review: What if it's Love?